(CNN) -- In the black market of prison life, cell phones have become perhaps the hottest commodity. Now, Texas is among a growing number of state governments going after them. 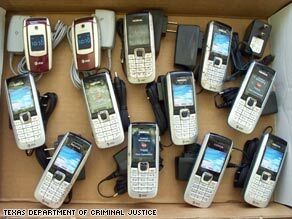 Hundreds of contraband cell phones were found behind bars or in transit to Texas inmates in 2008. Tiny, easy to hide and an unmonitored link for convicts to the outside world, cell phones are valuable contraband, fetching a greater asking price from convicts than some shipments of illegal drugs. John Moriarty, inspector general for the Texas Department of Criminal Justice, said that one phone can fetch as much as $2,000. "It takes one crooked prison worker to populate a whole prison unit with them," he said. More than 1,200 wireless phones sit in law enforcement evidence rooms, all found behind bars or in transit to Texas inmates in 2008. Moriarty is the investigator and bloodhound the state of Texas uses to trail the illegal traffic. "These are not stupid people," he said of the coordinated efforts to slip phones into the prison and hide them. "There are a lot of hands in between and they all want a piece of the action." Accomplices on the outside vary from family members, to friends to fellow criminals who buy or steal the phones and charge them with minutes. The contraband is then moved through an elaborate series of drop points and usually ferried into the walls of a prison by a guard or trustee -- an escape engineered in reverse. Finding the dirty prison employee is often the key. "Some of these guys make next to nothing, so you can see how easy it could be to corrupt them," Moriarty said. State Sen. John Whitmire, a Houston Democrat and the chair of the state senate's Criminal Justice Committee, became an ally of Moriarty's after one phone call in October. He picked up a phone slip from his secretary and called the number on it -- only to realize he had returned a call to a death row inmate's cell phone. The inmate, he said, was Richard Tabler -- a convicted double murderer who was sharing a wireless phone with nine other inmates. "At first I thought it was a hoax," said Whitmire, who said he called the state justice board and "read them the riot act." Whitmire is one of the sponsors of a bill in the Texas Legislature that would crack down on convicts caught with phones and allow prison systems to monitor and detect cell signals. It's en route to Gov. Rick Perry's desk after clearing both houses of the legislature this week. Other efforts are under way at both the state and federal level. In January, U.S. Rep. Kevin Brady, a Texas Republican, introduced legislation that would let prisons jam cell-phone signals within their walls. Last month, Maryland Gov. Martin O'Malley asked the federal government for permission to do so in his state. Prison officials in Arizona are training dogs to sniff out cell phones.